In Parts 1 and 2 we described the fundamentals of form-based codes (FBCs), explained why the development of FBCs is important to communities, and looked at key differences between FBCs and a conventional zoning code. In today's post, we will address in greater detail the typical elements of a FBC and how they enable it to shape public space and create walkable, pedestrian-friendly places. Unlike conventional zoning, the focus of a form-based code is on how buildings relate to the streetscape, not on what uses occur inside of them. As a starting point, it is important to emphasize that while a form-based code is a type of zoning code, it is more than a zoning code because it encompasses a wider range of issues than just zoning of privately owned land. The main purpose of a FBC is to create inviting and comfortable public spaces, including streets, sidewalks, plazas, public squares, and other places where people gather outdoors in public. Because a FBC also functions as zoning, it regulates land uses and the placement of buildings on lots. Unlike conventional zoning, the focus of a FBC is on how buildings relate to the adjoining street, not on what uses occur inside of them. FBCs use form as an “organizing principle” around which the other elements of regulation and design revolve. FBCs identify geographic areas or groups of areas and create “zones” for each that are based not on uses, but on desired community character, intensity of land use, and built form. Often these zones are tied to the urban-to-rural “transect,” which is a tool for categorizing character, intensity, and form. For a more detailed explanation of the transect system. A FBC may be based on the transect, but it can also be organized using other tools, such as street types or geographic areas with distinctive physical characteristics. The important thing is that the system is based on a place-specific vision and intended outcome, not on the division of land into use categories. A regulating plan is essentially a fine-grained zoning map combined with a street plan, keyed to a set of standards ... Each street, block, or parcel must comply with illustrated standards in the FBC. The most common tool for mapping a form-based code is a “regulating plan.” A regulating plan is essentially a fine-grained zoning map combined with a street plan and an open space plan, keyed to a set of development standards described below. It is detailed to the level of individual streets, blocks, public spaces, and sometimes even lots or buildings, which is a level of detail not found in conventional zoning ordinances. Each street, block, or parcel must comply with the illustrated standards in the FBC. Some city-wide FBCs contain a mechanism for developing regulating plans neighborhood-by-neighborhood over time (e.g. Cincinnati), while others detail the regulating plan for the entire city all at once (e.g. Miami). Most FBCs cover only a limited area, not an entire city, and that specific area (such as a corridor, neighborhood center, or downtown) is governed by its own regulating plan. 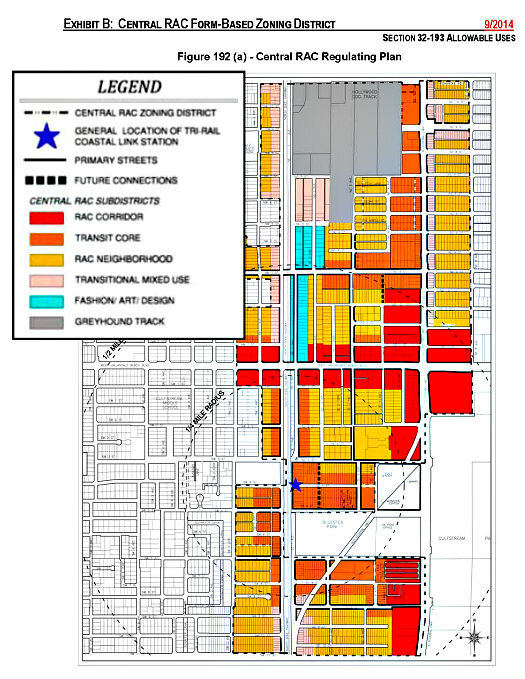 Above: Regulating Plan for a regional activity center in Hallandale Beach, Florida, prepared by Treasure Coast Regional Planning Council and Spikowski Planning Associates (legend enlarged for easier viewing). Below: use table from the same plan. This use table is also from the Hallandale Beach form-based code. As noted earlier, form-based codes generally include provisions aimed at preventing incompatible uses. Nothing could be further from the truth. 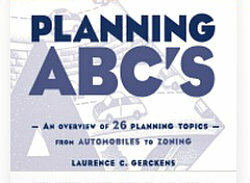 A form-based code is based on a vision plan for an area and is very specific to that place. A FBC addresses the physical context, such as natural areas, topography, and existing built environment, and is customized to what community residents have said they want, while also serving overall municipal planning objectives. It allows a neighborhood or city to express, develop, and maintain its distinctiveness. 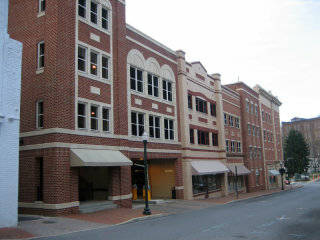 Some FBCs apply city-wide, but most are crafted for the downtown, for another area in need of infill redevelopment or revitalization, or for a specific neighborhood that is either under pressure for development or economically depressed and would benefit from a well-conceived plan and implementing code. ⇒ Frontage types -- these describe how the front facade of a building and the privately owned land between the building and the sidewalk relate to the streetscape. Examples of frontage types include Porch and Fence, Stoop, Shopfront (often with awnings), Forecourt, and Arcade. Illustration above of private frontage types. From the SmartCode Version 9.2. Click on illustration to access the pdf. Frontage types get to the heart of what a form-based code is all about: how buildings shape the public realm. Frontage types get to the heart of what a FBC is all about: how buildings shape the public realm. ⇒ Building types -- these may be in addition to, or instead of, frontage types. They identify typical and appropriate types of buildings within each area of a regulating plan and cover much of the same information as frontage types but extend to the entire building (height, massing, lot coverage, etc. ), not just to its front façade and the space in front of the building. The regulation of the streetscape is not traditionally part of zoning ... A major innovation in the FBC approach is integrating the regulation of the public and private into one coherent set of rules. 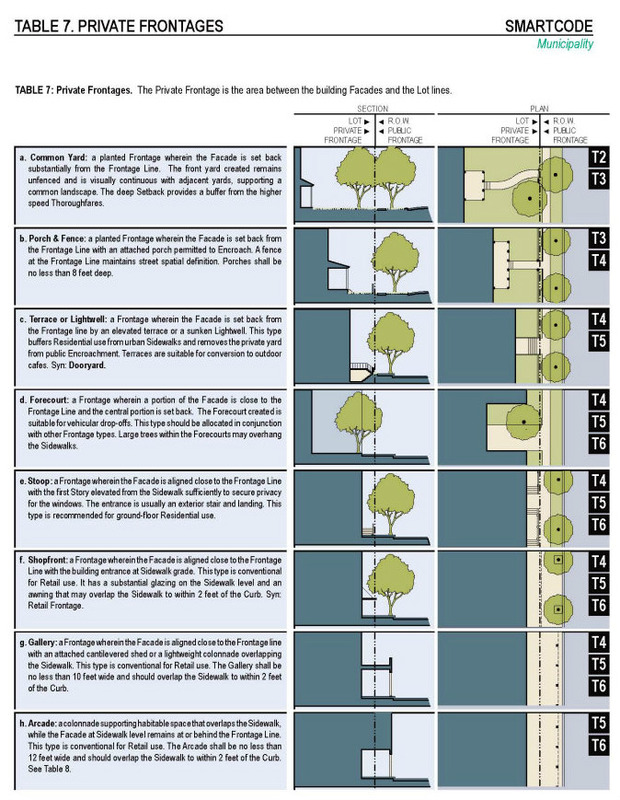 ⇒ Street and streetscape -- In addition to regulating the buildings and private spaces in front of them, FBCs crucially regulate the publicly owned space of the street and sidewalk. Detailed graphic cross-sections are typically used to identify portions of the street right-of-way (travel lanes, bike lanes, parking lanes, medians, cross-walks, etc. ), as well as the adjoining public areas (curbs, gutters, planting strips, furnishing zones for street furniture, sidewalks, etc.). Schematic cross-section of a mixed use street from the Sarasota County, Florida Form-Based Code. The regulation of the streetscape is not traditionally part of zoning, and is usually regulated by municipal public works departments or, in the case of new streets, subdivision regulations. A major innovation in the FBC approach is integrating the regulation of the public and private into one coherent set of rules establishing their relationships. Street regulations in a FBC are often designed to keep vehicular speeds low in order to maximize pedestrian safety and comfort, encourage bicycling, and minimize the noise and intrusion of vehicles. 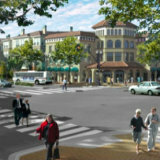 Most FBCs are designed to accommodate cars and to provide for on-street parking, but to subordinate vehicular speed to pedestrian safety. Yes, there's plenty of parking above and behind. Parking garage "liner" units in Staunton, Virginia. ⇒ Parking -- FBCs generally require parking to be on-street, behind buildings, or in parking structures that have “liner” units or buildings at street level. 1 Parking lots that front on a street are generally not permitted, and where they are allowed, they must be screened to maintain the street wall. The aim of all this is to activate street life -- by having retail or related uses line streets and sidewalks, not parking lots. Most FBCs have little or no minimum parking requirement ... a well-regulated market-based system with appropriate pricing mechanisms, can reduce parking demand. Most FBCs have little or no minimum parking requirement and sometimes have maximum parking limits. This is because excessive inexpensive or free parking can actually induce demand and associated traffic, while a well-regulated market-based system with appropriate pricing mechanisms, can reduce parking demand. Another common approach is the use of “shared parking” standards, which relieve individual developments from having to provide all parking on-site, while assuring that legitimate needs for parking are satisfied. Also, incentives for the conversion of private parking to public parking areas can ensure more efficient use of available parking spaces. Too much surface parking is one of the biggest problems in making a place hospitable for walking. Since an area regulated by a FBC is intended to be pedestrian-oriented, it is assumed that people driving to it will park once and do all of their errands without moving their cars to other parking spaces -- or that they will arrive on foot or by bicycle or public transit. Parking standards must be carefully crafted to the needs of a specific place, its development economics, and its access to transit. ⇒ Public Space Standards -- to guide the establishment and design of different kinds of public space, ranging from pocket parks to squares, plazas, riparian corridors, bike paths, and large natural parks. Most of these are created on public land, but some may be located on large privately-developed parcels as part of an overall site plan acceptable to the developer. The criteria for location and design of these spaces are based on the community vision plan, taking into consideration community needs for usable, publicly accessible open space of a particular character (rather than the unplanned residual open space often set aside under conventional zoning). Well-designed urban landscaping can integrate nature into walkable compact settlements, rather than leaving isolated fragments of nature in separated pods of development. The function of vegetation is to highlight, soften, and integrate the elements of the public realm, rather than to buffer them from one another -- which is often the purpose of landscaping under conventional zoning. Well-designed urban landscaping can integrate nature into walkable compact settlements, rather than leaving isolated fragments of nature in separated pods of development. FBCs often have incentive provisions for green infrastructure such as roof gardens, bioswales, urban agriculture, and rain gardens where appropriate to the surrounding context. ⇒ Architectural standards -- few FBCs regulate architecture strictly, and architectural standards are optional elements of a FBC. Most FBCs have little or nothing to say about architectural style and allow for architectural creativity. 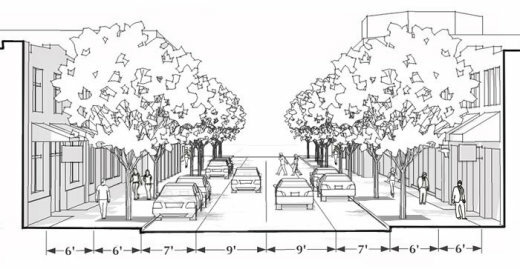 Instead, most FBCs include very basic provisions that regulate building articulation, window proportions, rhythm of openings, prohibition of blank walls, and placement of signs -- all with the goal of reinforcing the pedestrian scale of development. Some FBCs are adopted together with non-binding architectural guidelines that help explain what is desired without mandating any particular architectural style. FBCs are also sometimes accompanied by “pattern books” 3 that show the type of architecture that is desired, but not required. In historic areas, the additional overlay of historic district regulations can provide greater protection of historic structures and more detailed design regulation to maintain the architectural integrity of a neighborhood or streetscape. These may be incorporated into a FBC or remain separate. Form-based codes may or may not regulate architecture -- many do not. This is entirely up to the community. There is a difference between urban form, which is the way buildings shape a street and sidewalk, and architecture, which is the actual design of individual buildings. Form-based codes regulate urban form in order to create a pleasing public realm. However, many form-based codes allow modern as well as traditional architecture. There is no necessary connection between a form-based code and architectural regulation. An integral part of a FBC should be a set of streamlined procedures for ensuring prompt and efficient project review and approval based on clearly articulated standards. In addition to the regulating plan and associated standards, most FBCs include streamlined administrative provisions that enable landowners and developers to obtain approval of most projects. This can be done without additional extensive public review if the proposed development complies with all the requirements in the FBC. The rationale for this is that the entire area subject to the FBC has been studied and planned in a highly public setting and that the code has been adopted as the approved public vision by the municipality’s legislative body. Deviations from codes may be permitted through some type of special approval process that is more involved and designed to ensure that such deviations do not compromise the basic placemaking intent of the code. An integral part of a FBC should be a set of streamlined procedures for ensuring prompt and efficient project review and approval based on clearly articulated standards. 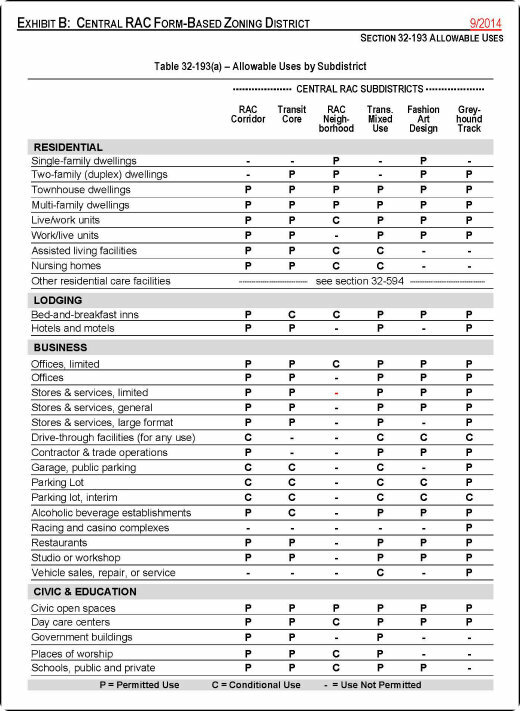 The typical elements described above do not appear in every FBC, but a FBC must contain sufficiently detailed requirements so that any educated person reading the document is able to understand the desired character of the area governed by the FBC, what the public realm will look like if the code is followed, and the procedures that must be followed to obtain development approvals. FBCs, when prepared by experienced, well-trained consultants or staff, should be clearer and easier to use than conventional zoning codes. This makes FBCs attractive to a variety of constituencies: landowners, developers, neighbors, planning and zoning administrators, public officials, and the general public. Next in Part 4, we discuss the planning process for developing a form-based code.